Despite the connotations inherent in his name Bill Whiskey, Bill Whiskey Tjapaltjarri who passed away in his 80’s in 2008, was a non-smoking, tee-totaller who initially came to be called Whiskers due to his long flowing white beard and wry humour. He was born near Pirrulpakalarintja outstation at Pirupa Alka, 130 kilometres south of the stunning mountains and rock formations of Kata Juta (the Olgas) and, in search for food and water, moved with his family to Uluru (Ayres Rock) during his adolescence. By the time he was a young man, he had made the journey to Haasts Bluff mission, about 250 kilometres to the northeast. After marrying Colleen Nampitjinpa, a Luritja woman with whom he had five children, he worked at Areyonga and they eventually returned to Haasts Bluff before moving to the newly established outstation of Amunturungu (Mt. Liebig) during the 1980’s. Together their renown as skilled healers, or ngangkari, spread far and wide and they became greatly respected for their traditional knowledge and authority. Bill Whiskey did not begin creating his finely dotted, colourful canvases until the last four years of his life and yet, despite his advanced age, he was able to complete a number of large canvases amongst an oeuvre of no more than 200 works. His subjects included his own early travels and also the mythic battle related in the Cockatoo Dreaming that occurred at his birthplace, Pirupa Alka. This ancestral story involves three birds, the White Cockatoo, his friend the Eagle and the aggressive Black Crow that attacked the Cockatoo in order to steal his witchetty grubs. During their terrible battle, white feathers were scattered about, and the landscape became indented by the entangled birds crashing to the ground several times. Subterranean streams filled these impressions with water and a circular amphitheatre was created by the sweep of wings. In his finest works, colourful blues, yellows, reds and greens, always tempered by Cockatoo white, represent the wildflowers that grow in profusion after rain. This particular example, painted just prior to his death, depicts rockholes near his ancestral home in the vicinity of the Olga’s and the waterholes created by the birds as they crashed in to the ground during their epic battle. Bill Whiskey may not have begun painting until 2004 yet it took but an instant for him to gain national renown. Promoted through the Watiyawanu Art Centre, Whiskey’s work was presented in no less than a dozen exhibitions during the following 4 years. His first works appeared on the secondary market in 2006 when a fine 152 x 90 cm work achieved $12,000 at the Lawson~Menzies November sale. The market simply couldn’t get enough of his works throughout 2007, and the dearth of major works in primary market galleries saw a fine 181 x 181 cm canvas created just months earlier sell at an auction in November for $72,000. This was more than twice his gallery price at the time. No more than 4 months after his death the following year, a magnificent work measuring 180 x 270 cm with predominant coral colouration prompted a bidding war at the Lawson~Menzies September sale. Estimated at $80,000 to $100,000 it exceeded its high estimate on the wings of spirited bidding before eventually being knocked down at $144,000, making Whiskey the most collectable artist of the moment alongside fellow Pitjantjatjarra artist Tommy Watson. Bill Whiskey’s bold bright painting style reflected his indomitable spirit. In his 80’s he became the first artist to depict the major Dreaming story and the creation of major sites throughout his country. These works are imbued with authority and steeped in traditional knowledge. 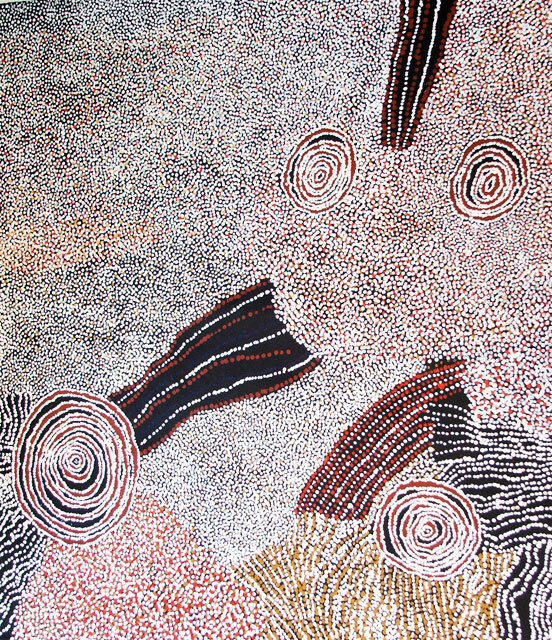 His artistic legacy may be small but it set a remarkably high standard and, as a result, Bill Whiskey’s works have become amongst the most highly collectable of all contemporary Aboriginal art.